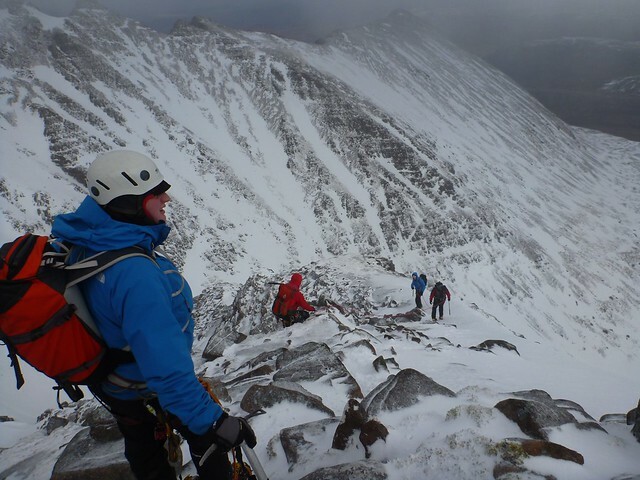 Discussing this weekend trip towards the end of last year, I was told (by those in the know) that I'd be "following in the footsteps of the giants of Scottish Winter Mountaineering". Sounds good, count me in, I thought at the time. 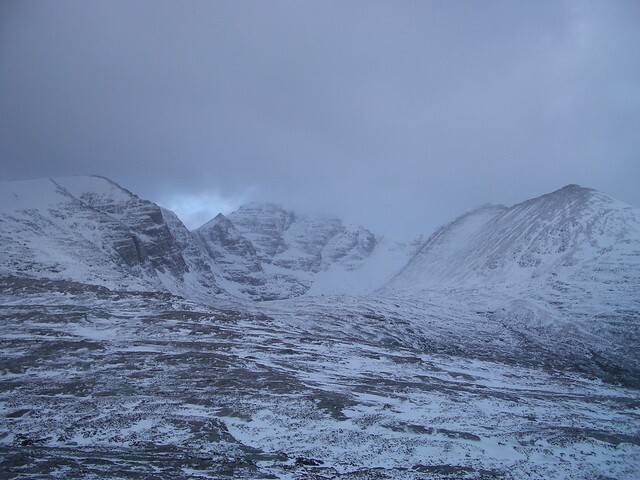 Roll on a couple of months or three and we're setting off from the central belt on a dank, cold and windy late-February evening, bound for Dundonnell, with a view to completing a traverse of An Teallach at some point over the course of the weekend. 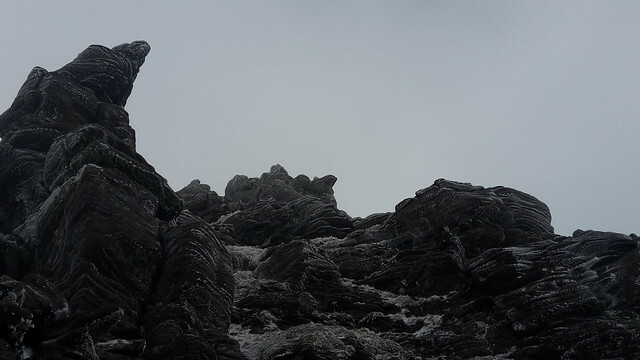 I'm a walker, not a climber and not great with exposure (though, improving all the time) and, while I can now enjoy a good scramble over dry rock in Summer, the weather forecast in the area for the weekend was less than favourable. It’s fair to say, therefore, I was approaching the whole thing with a degree of trepidation. There was much deliberation over whether to attempt this on Friday (the original plan) or Saturday, much of which involved poring over the various weather reports, each more horrific than the last. After a detour off the A9, due to a road accident at Bankfoot, a quick refreshment stop in Aviemore and some challenging road conditions between Braemore Junction and Dundonnell due to snow and ice, we arrived at our base, Sail Mhor Croft Hostel, after 11pm, by which time a decision had been made to place our faith in the least grim forecast and aim for the traverse the next morning...on the basis that Friday looked marginally less terrible than Saturday and the promise of a "lull" swung it. By the time we'd stowed our gear and organised ourselves, it was 1am and we’d be up at six for a 7am start. 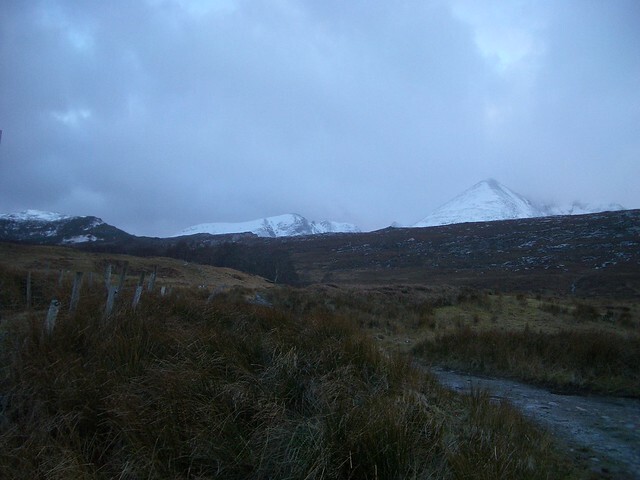 In what felt like no time, we were all up and about the hostel again preparing to brave the conditions. 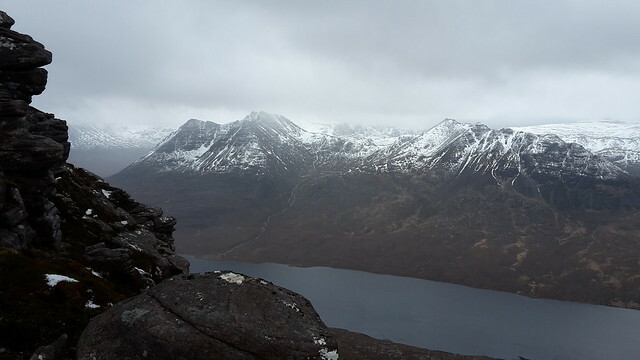 It was very windy and raining hard but, we decided to stick with the plan and aim to get up on to Sail Liath and make a judgement on the ridge from there, if not before. Starting from Corrie Hallie, it's fair to say we weren't holding out much hope for achieving our goal, it was still raining so put on waterproofs but within a few minutes walking it was off and, contrary to the forecast, don’t recall any more rain thereafter, which we were to be most grateful for. 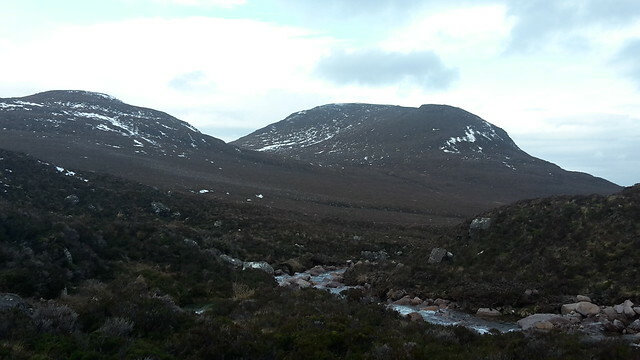 We wandered all the way up the track, eventually taking the right fork on to the lesser track for Shenavall Bothy and breaking right again off the track well before the bothy, to tackle the steep and increasingly snowy East flank of Sail Liath. We paused for a refreshment just before Lochan na Brathan at 400m and, having opted for a steeper line to stay out of the wind as much as possible, to don crampons and have ice axe to hand (we also put our harnesses on at this point to save messing about if and when the scrambling began). Nice...bit more promising, still in the balance though! 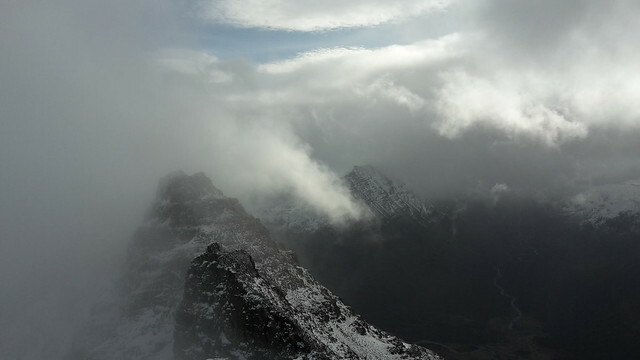 The cloud base was fairly high and was either at or just above the summits for most of the day. The wind blew hard all day, with the very occasional, but welcome, lull and when it did blow, once on the ridge, it was blowing from behind and over our shoulders. The weather in general though was proving to be so much less of an issue than any of the forecasts had suggested, for which we were grateful. 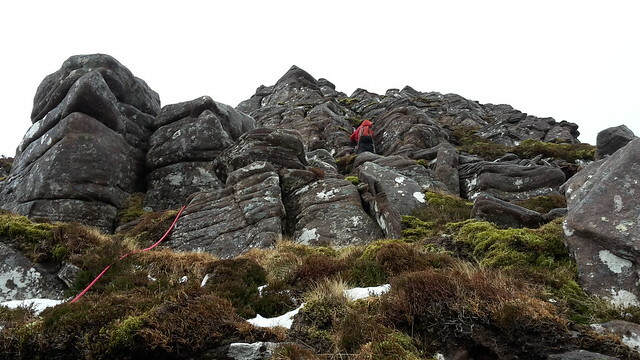 We decided to tackle the ridge and pinnacles (and the Munros as well, if conditions allowed). This was in stark contrast to the other group in our party who, we later learned, had gone to the Fannichs and, having reached Sgurr Breac, then encountered whiteout conditions on the way over to A’Chailleach and were bombarded for over two hours, beating a retreat in high winds, driving snow and extremely poor visibility. My camera died at this point, mainly because I thought I'd charged it but hadn't I didn't locate my phone until much later in the day so the next few photos are courtesy of others. 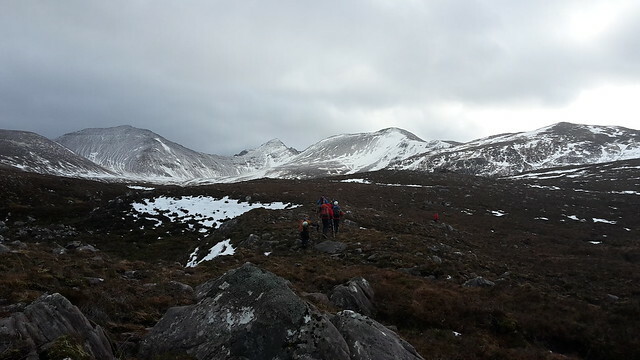 On the final approach to Sail Liath, I’d begun to experience cramp in my quads/thighs, mild at first on my right and becoming severe on my left. I’ve had this before but, it’s been a while and began to drink little and often to combat it and took on some more food. This provided some temporary relief but, on route from Sail Liath via Cadha Gobhlach to Corrag Bhuidhe, I was really toiling and just as it began to ease in my left leg, it worsened in my right and got so bad, I was covering very little ground and, because of the tight schedule, it began to feel like it might have an impact on our ability to complete the traverse. This made things pretty uncomfortable when some daggering was necessary on exposed icy drop-offs. To add insult to injury, my left crampon came apart while descending, luckily didn’t lose any important metalwork and got it back together but, tough to get back on when you can’t bend your leg! I didn’t wish to be “that guy” however and, even though the odd negative thought was creeping in, pushed on and the cramp itself eventually eased up (the negative thoughts were countered by memories of an old football coach, in a cup tie that had gone deep into extra-time, telling me to run off crippling cramp…that brought some light relief ). Thankfully, the cramp did NOT return to my legs although, they both ached for the rest of the day. We took a welcome breather while getting organized for the scramble up Corrag Bhuidhe and over the pinnacles, there were 7 of us and split into groups of three and four on the ropes. 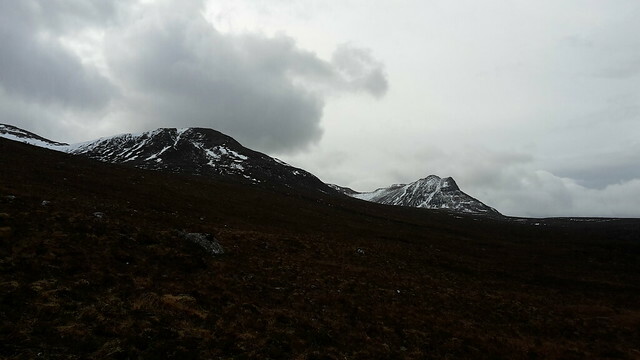 Impressive views of the stunning looking Beinn Dhearg Mor & Beag accompanied us for the most part of this section. 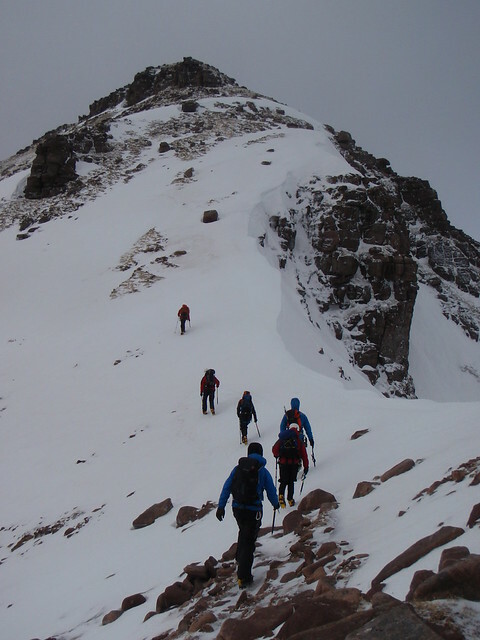 The conditions on the ridge were of firm snow, hard ice, well frozen turf and rimed rocks. This called for a focused approach and care was needed to negotiate this safely. 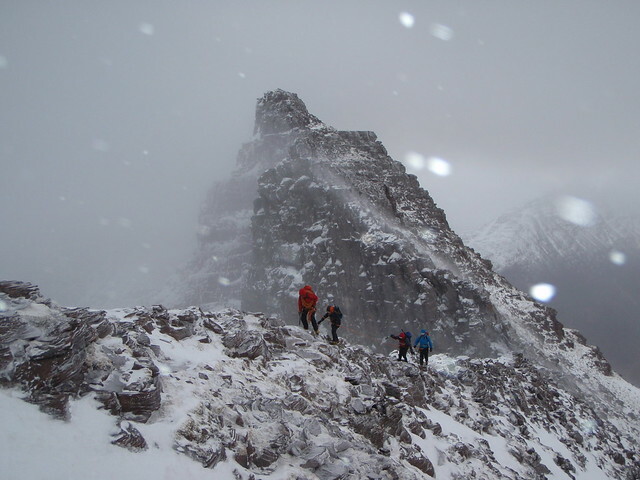 That said it was great fun as the wind continued to blow hard over our shoulders but, the promised heavy rain and snow never came and the worst we had to contend with was wind-blown spindrift, sometimes interspersed with the occasional short hail shower. It was a little too rimy on Lord Berkeley’s Seat for us all to attempt to get up there so we bypassed it and headed on to the first Munro of the day, Sgurr Fiona (1060m). The scrambling was over all too soon it had seemed but the time had raced by and it was after 2pm when we reached the summit of Sgurr Fiona. 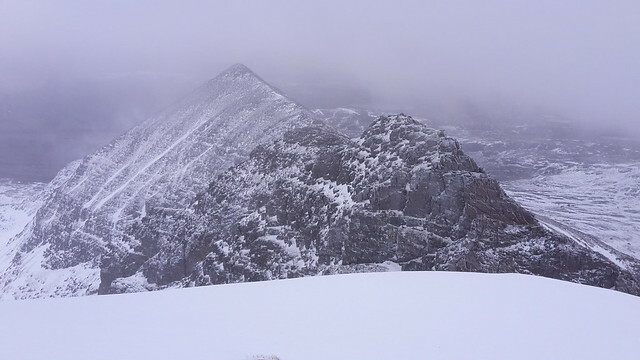 We had a good look along to the outlying top of Sgurr Creag an Eich but, there wasn’t going to be time to tackle this today. 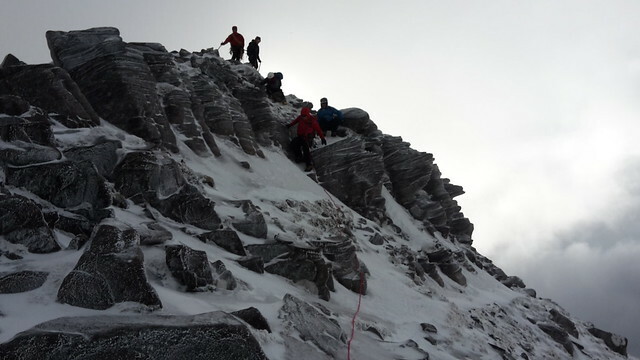 We’d kept the ropes on to see what the descent from Sgurr Fiona was like and the ice was particularly hard and scoured, requiring great care and attention so, this proved to be a wise decision. It made for a slow, seemingly endless descent to the bealach but, we had good views down to the snowy arête between the two Munros. As last man on the rope for the ascent, I had to lead the descent so, it was good to have something to concentrate on. 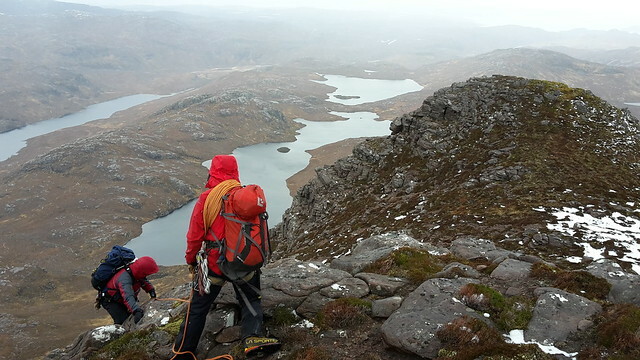 Incredibly and frustratingly, I began to experience cramp in both hands and wrists although, not quite as bad as the legs earlier, this would thankfully subside before we reached the next summit and we dispensed with the ropes at the bealach. The walk up to Bidein a’ Ghlas Thuill (1062m) looked steep but, by now, we knew we were making it and it didn’t seem quite so bad. 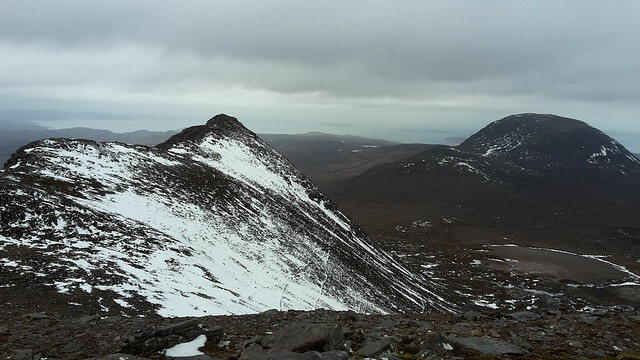 We summited at 3.15pm and took in the near views, with the tops, Glas Mheall’s Liath & Mhor, looking impressive however, they’d also have to wait for another day. It felt good and we dropped down to the bealach with Glas Meall Mhor and over Sron a’ Choire (863m). 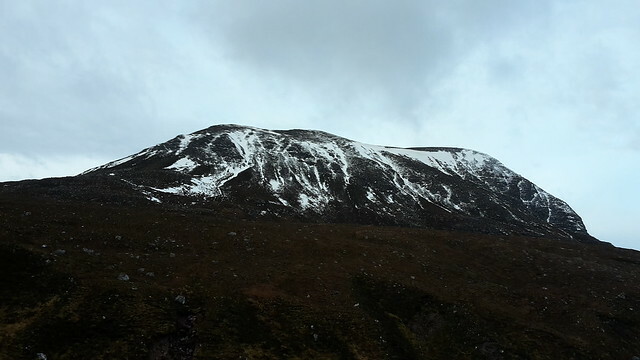 We walked out on a cocktail of elation and adrenaline through the coire, contouring Meall Garbh, breaking to eat and remove crampons halfway down and reached the road three hours after the last Munro at 6.15pm! We were strung out by now and walked along the road towards the hostel before being picked up by the wet and bedraggled walkers returning from the Fannichs. 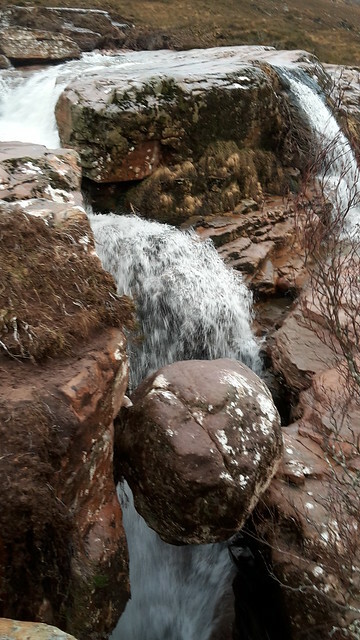 Thoughts were already of warm showers, clean clothes, hot food, cold beer and sleep, all with the feel-good factor of having completed the winter traverse of An Teallach, a long, but very rewarding day. 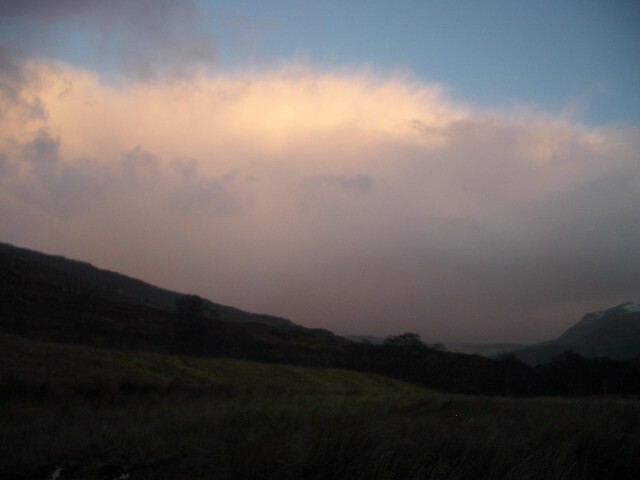 The evening before had featured more deliberation over weather and where to go for a scramble. The forecast for Saturday was still uninspiring and we considered going as far North as Stac Pollaidh & Cul Beag and South of us to Slioch but, no-one was really up for a huge day or a long drive so, preferring to remain in the immediate area and hopefully find more wintry conditions, that was all factored-in. 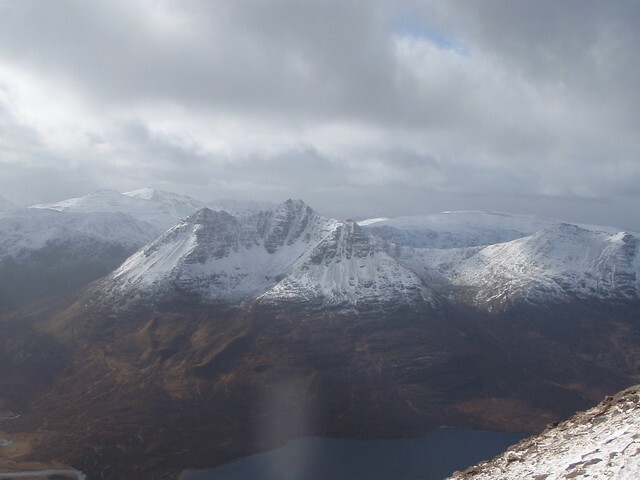 The decision was therefore to do a recognised scramble on an outlier of An Teallach, Sgurr Ruadh, and, depending on how folk were feeling and weather conditions, make the hike up on to the Munro Top, Sgurr Creag an Eich, that we’d admired from Sgurr Fiona the previous day. 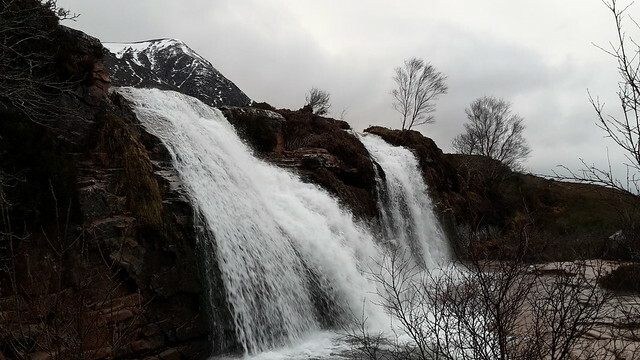 This entailed starting from the main road, just along from the hostel, at the outflow of the Ardessie’s impressive waterfalls into Little Loch Broom. Starting and sticking with the East side of the river, the waterfalls were magnificent however, aching somewhat from the previous day’s exertions, it was head down and up the steep terraces to the head of the waterfall (I’d take lots more photos of the falls on the walk out, I figured). 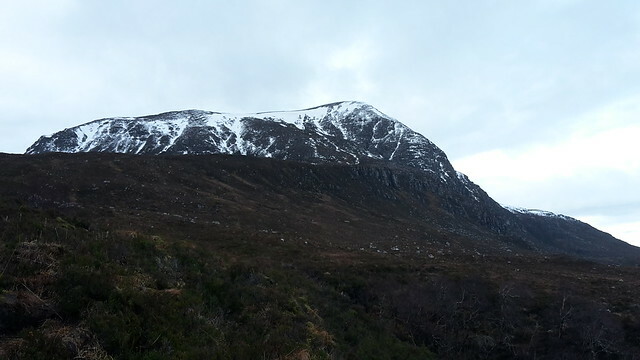 We had good views of tomorrow’s target, Sail Mhor, which was virtually free of snow today. 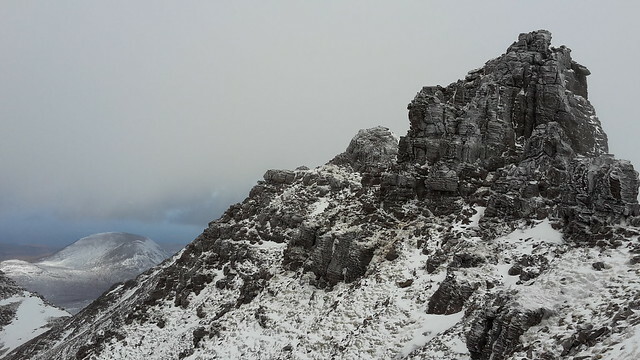 It proved to be a long walk-in to the base of Sgurr Ruadh and, learning from yesterday's experiences, I was eating and drinking little and often and, thankfully, had no repeat of the previous day’s cramping. Approaching our objectives (r-l: Sgurr Ruadh, Sgurr Creag an Eich) and, to the left of those, yesterday's munros Sgurr Fiona & Bidein a'Ghlas Thuill. 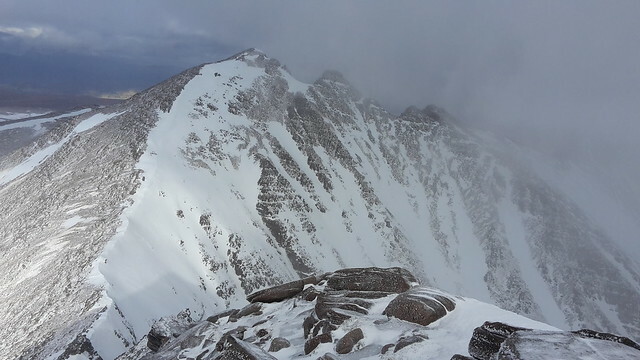 Unfortunately, most of the snow that Sgurr Ruadh had held the previous day had gone so, our gamble on what is a Grade 1 summer scramble on Sgurr Ruadh, was almost just that. This worked well however and we were able to take a number of harder variations on the short buttresses on the North ridge. In teams of three and four again, the 4-man team had a near miss when the lead climber stepped upon a loose slab the size of a headstone. He managed to avoid falling but the slab bounded on down over the buttress and, thanks to some nifty footwork from the last man on the rope, narrowly avoided seriously injuring anyone…a very close shave. 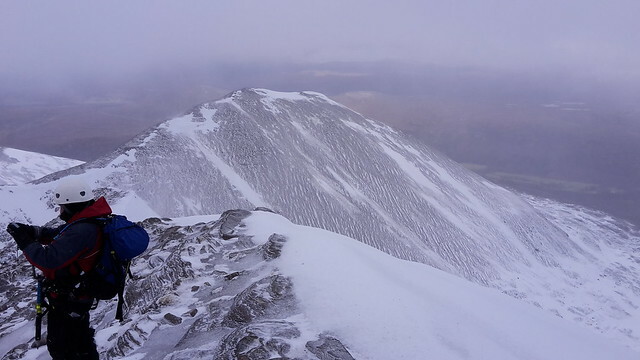 After completing the scramble, we dropped into the snowy col beyond the summit of Sgurr Ruadh for some food and shelter from the wind. The weather had again turned out better than forecast thus far. The group decided to split at this point, due either to fatigue or injury, and three headed back to the hostel, descending the snow from the col, while the remaining four opted to tackle Sgurr Creag an Eich (1017m) before returning to the col and descending the same way as the others, albeit some two hours later. 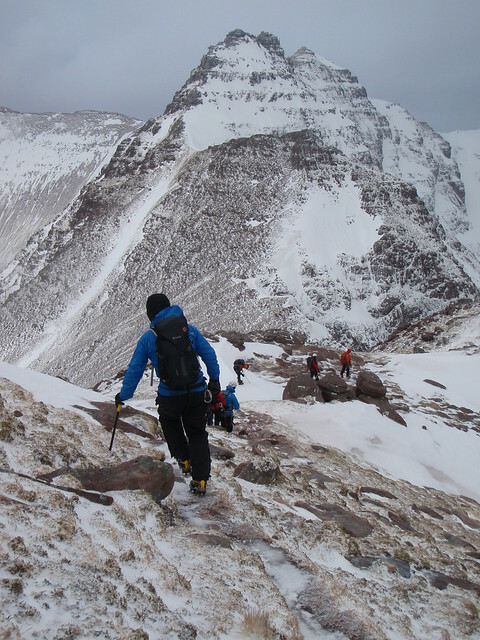 We set-off on steep ground, with the crampons in the packs should we need them. 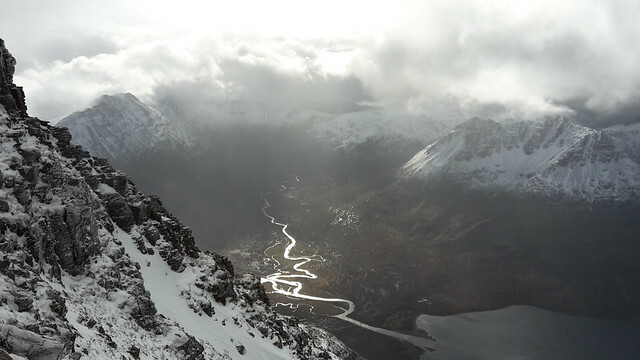 The weather did worsen a bit on the way up here and we were bombarded by spindrift and hail for most of the way, visibility wasn’t brilliant. Not enough to hinder our ascent but, no views to speak of on this section. 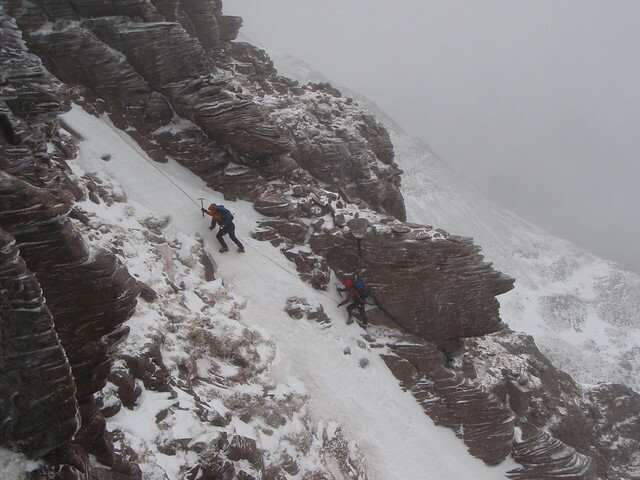 After a little over an hour, we reached the top of what is a fairly narrow summit ridge and, while we hung around for five minutes or so, being buffeted by the wind, in the hope the summits of An Teallach would clear for a photo opportunity, they did not clear sufficiently and we retreated the way we'd come up, returning to the col two hours after setting off from there. We enjoyed a bum-slide from the col to the plateau below. 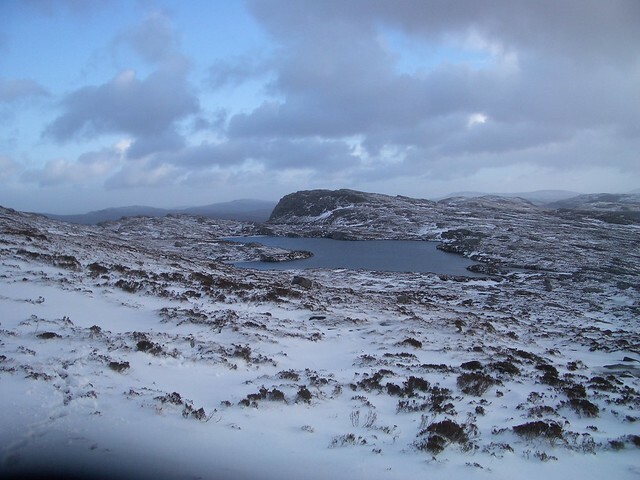 There was now just the small matter of the walk-out, which would again be lengthy over tussocky and fairly boggy ground (though, bizzarely, there appeared to be a dry lochan on the plateau…Lochan Ruadh) from where we now were. 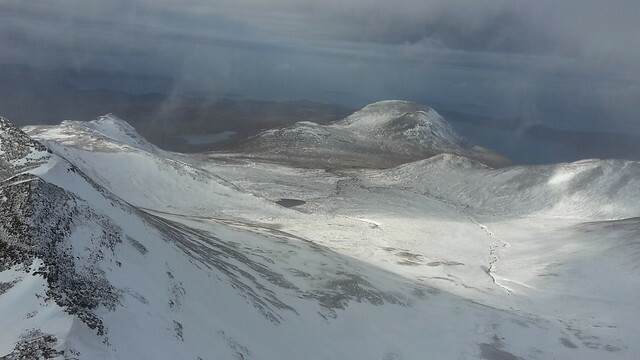 A mental note was made about Sail Mhor’s almost snowless appearance and that neither ice axe nor crampons would need to be carried next day…unless the weather/forecast changed. 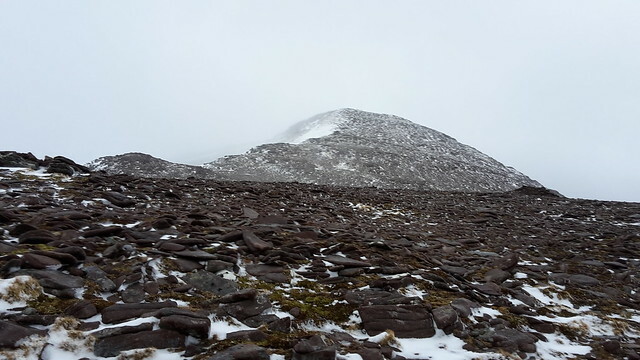 The hillwalking team had today attempted Bidean a’Ghlas Thuill (An Teallach) but, were beaten back by high winds and tricky underfoot conditions just after the col with Sron a’Choire. Having to cross the upper reaches of the Allt Coir' an Teallaich, which flows into the Airdeasaidh, we spread out to find a good place to cross and I spotted a submerged sod that seemed solid enough to hop on to and get across. One over, I was about to go when the remaining lady in our group appeared by my side, said “I’ll go next” and promptly dropped into the icy waters to above her waist. Luckily, there’s nothing of her and, I grabbed her rucksack and pulled her up on to the bank. Much laughter ensued and we thought we’d best crack on as, while we all had spare dry, upper body clothing, that was all we had and we needed to stay on the move. She was well wrapped-up anyway plus, she has “previous”! Had this occurred on the walk-in, it’d have been a game changer. So, we kept on the move for most of the return and were soon back at the falls. 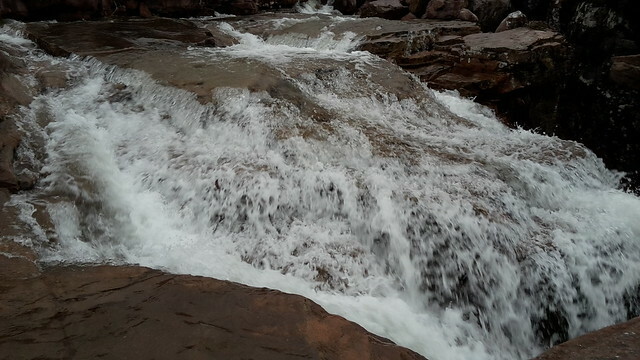 We took more time to appreciate the waterfalls on the way back and they really are stunning. 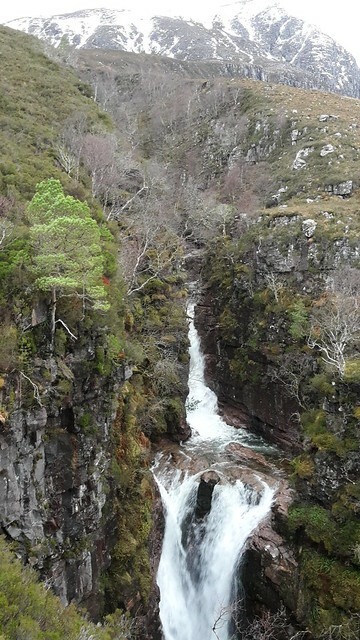 It actually looks like it would be great for a bit of gorge-walking/canyoning with abseiling and has some great pools for taking a dip…in Summer of course!! Back at the road at around 5.30pm, it’d been another big day, nothing on the day before but a biggie all the same. Tomorrow would be less so, on Sail Mhor (covered in a separate walk report), as we were looking to be heading for home by early afternoon. What a great adventure - minus the cramp ! and really great photos that capture the conditions perfectly! Enjoyed that read! Mountainlove wrote: What a great adventure - minus the cramp ! and really great photos that capture the conditions perfectly! Enjoyed that read! 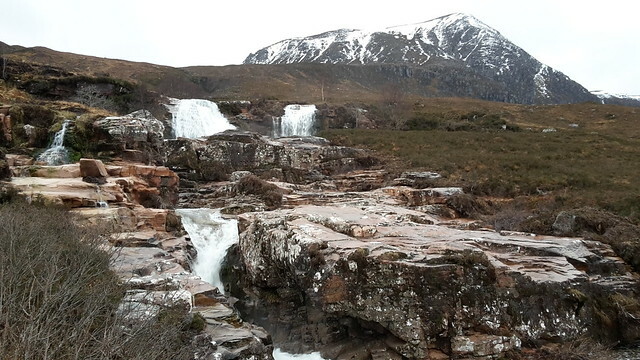 Enjoyed your recent Liathach TR, another biggie for my list, superb day you had for the 200! Ref cramp: I used to suffer a lot, but I found out about 20 years ago that the standard remedy on the continent is magnesium. I always take a couple before a big walk now, and I've not had any further problems. I don't know why this isn't more widely known in the UK. My GP brother can't explain it either, and he often has recourse to this when we're walking, being quite prone to cramp. Thanks, Altenacker. Appreciate the tip. I've been out a couple of times since and no repeat so far but, happy to give magnesium supplements a go to prevent it. Great report BV. Just hope your not planning as much exposure in knoydart on June. If so, cramp will be the least of my worries! Avocetboy wrote: Great report BV. Just hope your not planning as much exposure in knoydart on June. If so, cramp will be the least of my worries! Cheers, AB. It'll be warm, dry and sunny in June so, a little exposure but mainly when mooning the compleation party on Sgitheall! Thanks, Collaciotach, it was a grand experience. Fabulous report and photos. Hope your cramp doesn't recur. 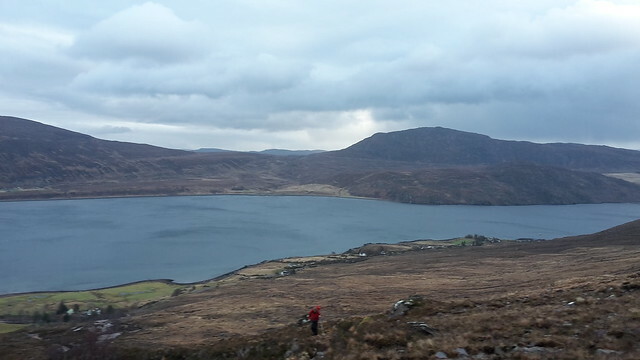 Great pictures, especially the one with your party strung out in front of Lord Berkeley's Seat / Corrag Bhuidhe and the one looking over Sealga to Ben Dearg. AnnieMacD wrote: Fabulous report and photos. Hope your cramp doesn't recur. 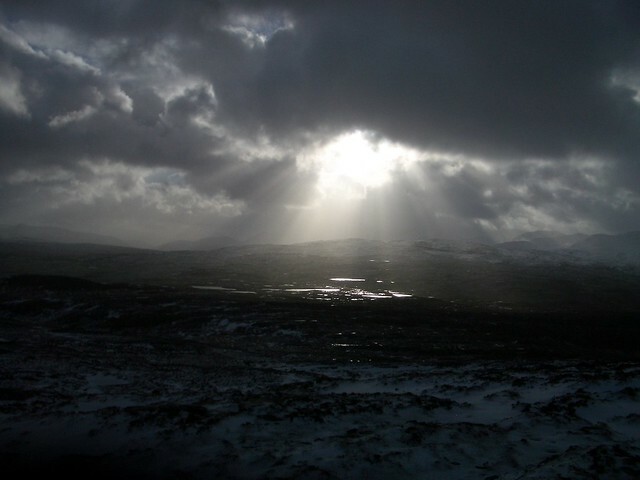 litljortindan wrote: Great pictures, especially the one with your party strung out in front of Lord Berkeley's Seat / Corrag Bhuidhe and the one looking over Sealga to Ben Dearg. Set-out on a high, into the doldrums for a bit (struggle to even remember some of the views in the pics from the first hill section) but, thankfully by the best bits - the pinnacles and the munros - all was good again and definitely finished on a high.